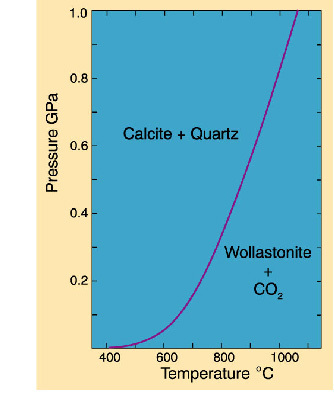 Equilibrium phase relationships between calcite, quartz, wollastonite and CO2. Image courtesy of Darrell Henry. 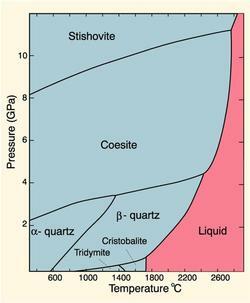 Standard phase diagrams are graphical representations of the equilibrium relationships between minerals (or others phases). These relationships are governed by the laws of thermodynamics. Standard phase diagrams show how phases or phase assemblages change as a function of temperature, pressure, phase composition, or combinations of these variables. Some phase diagrams (those for 1-component diagrams) depict relationships involving multiple phases having the same composition (for example, the relationships between the vapor, liquid and solid forms of H2O). Other diagrams (such as the one shown on the right), depict the relationships between a number of compounds having different compositions. Still others show how compositions of phases change under different conditions. 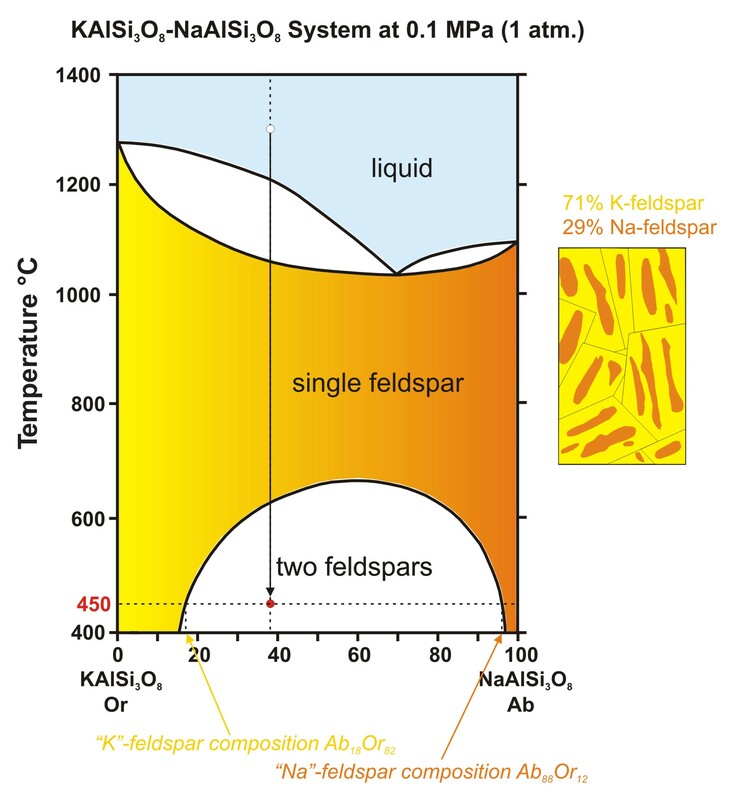 Pseudosections are a type of phase diagram that shows the fields of stability of different equilibrium mineral assemblages for a single bulk-rock composition. 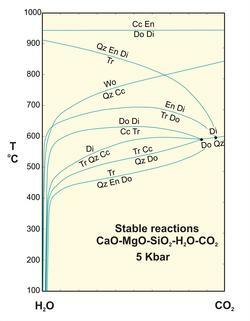 Standard phase diagrams may include many reactions but, depending on its composition, a particular rock may only experience a few (or none) of them. Pseudosections only include those reactions that affect a particular composition. Fields on a pseudosection are labeled (specifying the equilibrium mineral assemblage) with the reaction lines unlabeled (although the specific reaction can be deduced). 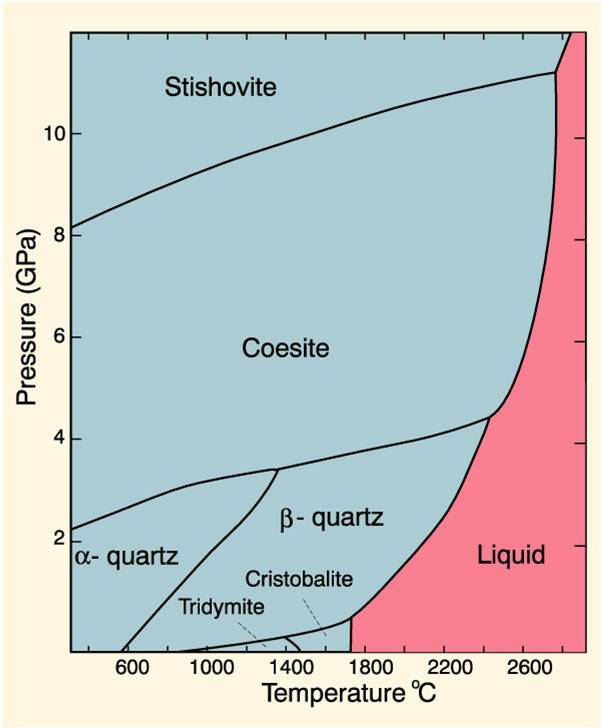 This is a diverse collection of phase diagrams, intended to be used by instructors when teaching petrology or mineralogy classes. Most of the thumbnail images are jpg files. However, we provide links to pdf files of all diagrams. They can be viewed, printed, or edited with Adobe Illustrator or Corel Draw. An easy way to do this is to open the files using Acrobat or its equivalent and then save them as eps files or in some other format that your graphics program can import. Besides single page diagrams, we also provide animations for some of the more useful systems. The animations are multi-page pdf files. Click image to enlarge. Image courtesy of Dex Perkins. 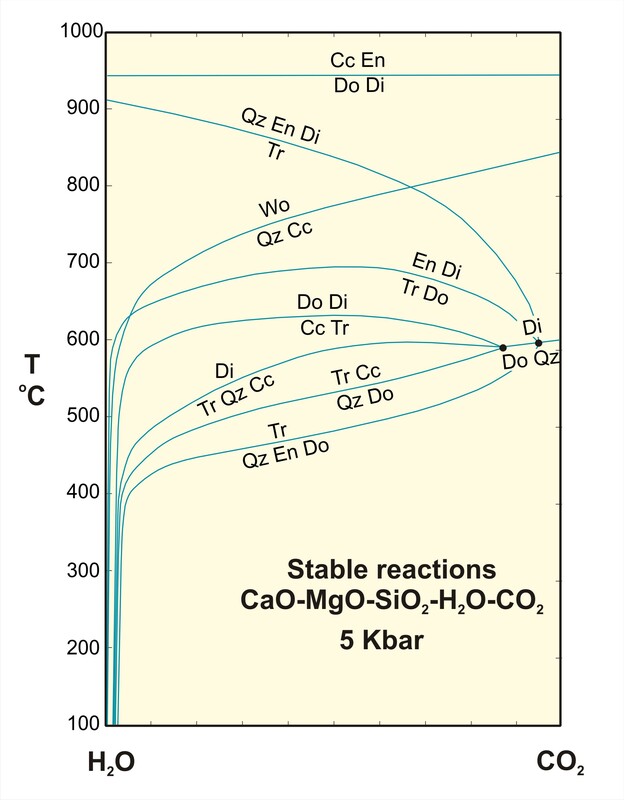 These temperature-composition (TX) diagrams show melting relationships, and some subsolidus relationships, involving two chemical components. Some involve incongruent melting; most do not. 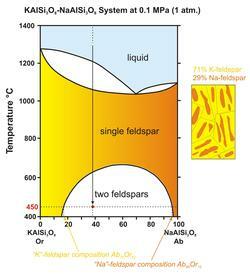 Some of these diagrams involve eutectic and peritectic relationships. 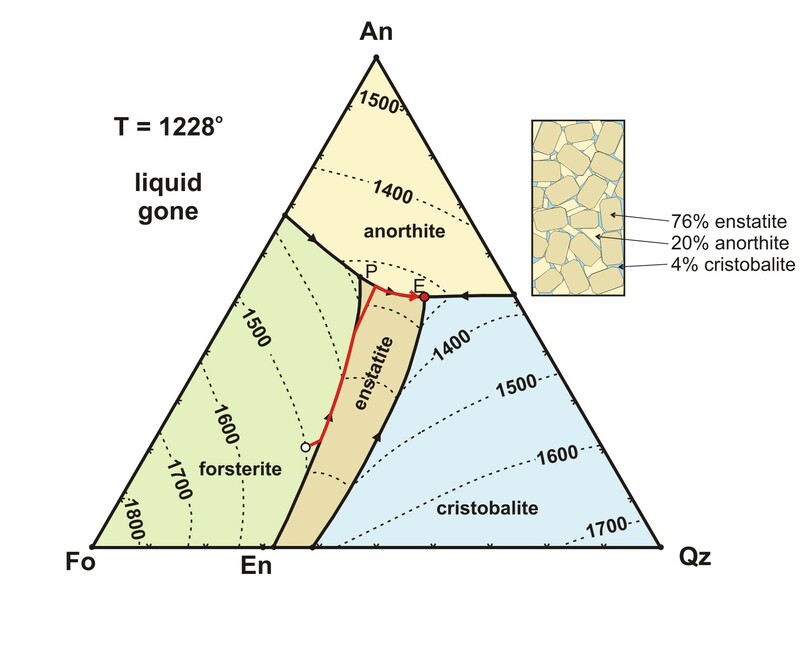 Ternary igneous phase diagrams are triangular diagrams that show melting relationships involving three chemical components. The diagrams may involve eutectic, peritectic and cotectic relationships. 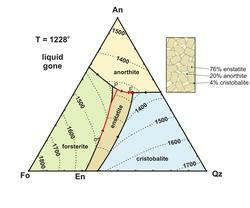 Natural metamorphic systems may involve many chemical components. 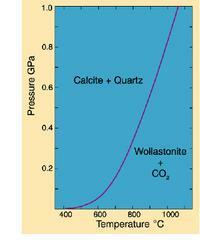 To simplify analysis and interpretation, petrologists may study model systems containing only a few components. Some of the diagrams available here involve only a few components and a few phases. Others are more complex. Phase diagrams that show many reactions that take place in a single chemical system are termed "petrogentic grids." 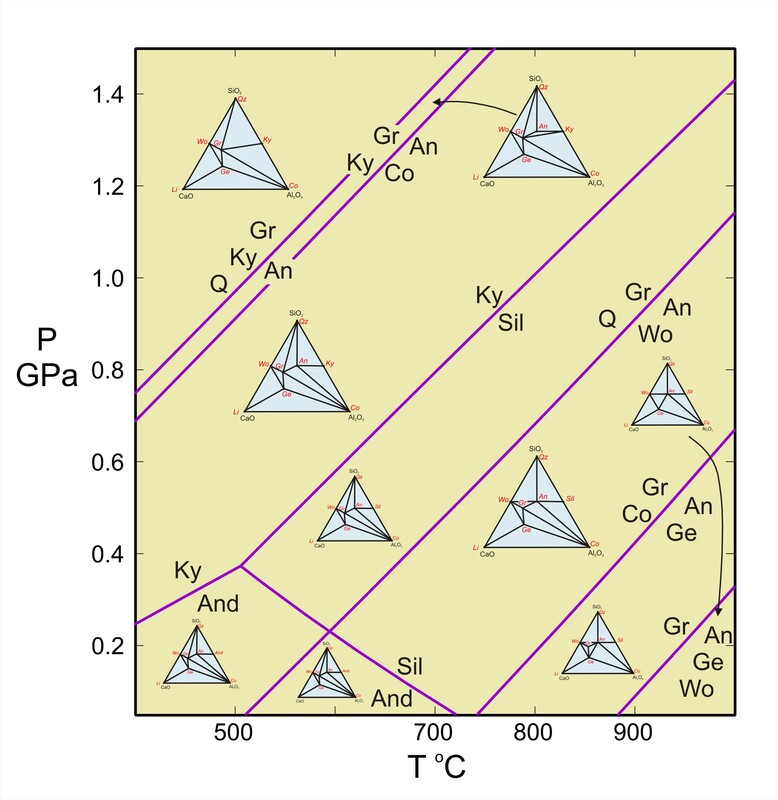 Petrognetic grids generally involve more components and more reactions that simple model metamorphic systems. The idea is to include enough components and phases so that the grid may be used to interpret natural metamorphic mineral assemblages. 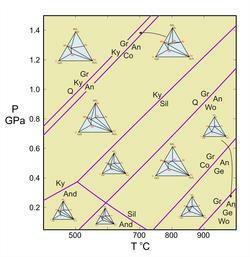 Download metamorphic P-T phase diagrams. Download metamorphic T-X phase diagrams. Click image to enlarge. Image courtesy of John Winter. The above examples are of phase diagrams commonly used by geologists. Phase diagrams are also useful in other fields, including chemistry and engineering.